As I needed to fit new tyres on the front, I thought I may as well have all 5 wheels refurbished at the same time. 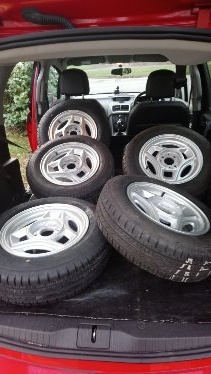 I took them to a first rate wheel refurbishers in Guildford who had previously done a fine Job on a set of Momo wheel on my Coupe. I had a phone call the next day asking me to call in and see a problem. So I did. Once the old paint had been stripped off the wheels were pitted with corrosion all over so it wasn't to be a quick job to fix. 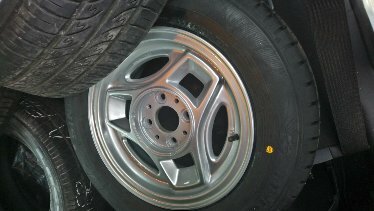 Basically with the old wheel's high magnesium content in the alloy once corrosion starts it carries on under any paint. Unfortunately I didn't think to take a photo of the wheels in this state. 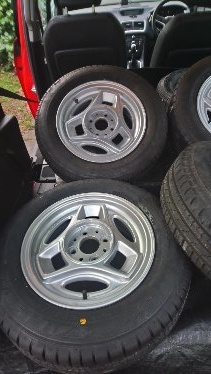 The cure is to degas the wheels by keeping them in a warm oven for a couple of weeks to evaporate all traces of gas in the wheel, otherwise it will simply blow any subsequent paintwork quickly. They then gave the wheels 2 coats of powder coating so the appearance was acceptable. Another issue which came to light was that these standard wheels are unsuited to modern tubeless valves: there is no mechanical lock in 40 year old alloys and the valves are held in purely by air pressure inside the tyre. I had been lucky and not had a problem. The safe thing to do is to fit tubes, which I had done. The finished results look good and made me realise just how scruffy the olf finish really was. Last edit: by Pete Pearson.